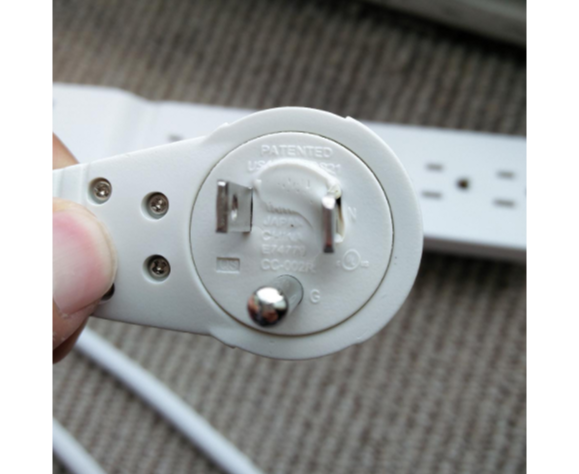 The plug rotates 360 degrees, yet still allows the hot, neutral, and ground wires to stay connected. It does this with the help of slip rings. Slip rings are devices that transmit one or more electrical signals across a rotating joint. Large slip rings can carry 100 or more separate circuits. Most car alternators use slip rings to supply DC excitation current to the rotor. Mechanically they are close cousins to commutators, used to transmit power to DC motors. The difference is that a single slip ring is a single connection, where a commutator is a switching device — in a motor it commutates current to one of several coils. Packaged slip rings used to be expensive, hard-to-find items. Thanks to globalization, you can pick them up at Amazon. A twelve-circuit slip ring will run you $9.99 shipped to your door. The thing with slip rings is that they are mechanical devices. They wear, they can shatter, and the connections made across them can become intermittent. If you’re powering a circuit through a slip ring, it’s a good idea to put your power supply circuit after the ring, and include enough capacitance to soak up any intermittent connections. I’ve seen older FPGA chips latchup and heat up enough to desolder themselves off a PCB due to power transients caused by a bad slip ring. I knew I would be tearing down this connector, but Belkin gave me plenty of information before I got out my screwdriver. Printed on the plug itself was PATENTED USA 5,775,921. The inventor of this particular rotating plug design is Jonie Chou, and Belkin has licensed the patent. Belkin also has their own patents on similar devices, most invented by John Wadsworth. In fact, there are 17 references to Jonie Chou’s patent from Belkin assigned patents. It’s safe to say that Belkin is heavily invested in rotating plugs and outlets. Rear of the plug. Notice the tiny contact patch on the neutral (top) connection. I kept the ‘921 patent close by as I tore down the rotating plug itself. The 4 screws were easy to remove. 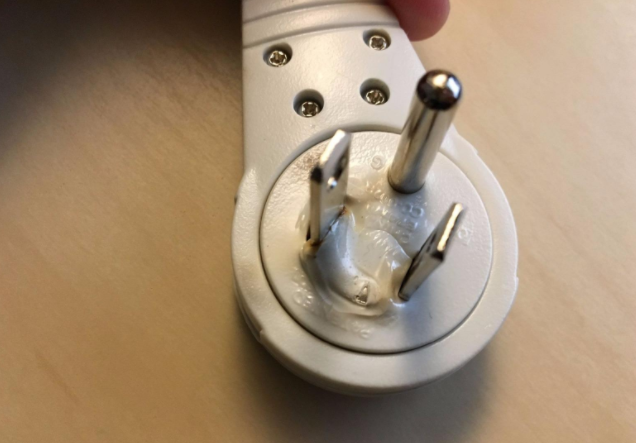 The plug didn’t come apart though. It was glued or ultrasonically welded. I had to pry it apart using a utility knife blade as a wedge. The construction of the plug closely follows Figure 1 in the patent. Springs hold the two rings in place: number 5 for neutral and 6 for ground. Hot is a shaft on the plug end which rotates in a sleeve on the cord end. The neutral side has a tiny contact patch on the slip ring – I measured it at 2.24 mm x 1.24 mm. The rings themselves are 0.7 mm thick. Comparing the construction to the failure photographs from the Amazon reviews paints a pretty clear picture. The neutral slip ring forms a resistive connection. This creates heat, softening plastic, and eventually causes arcing as the connections fail. The ground conductor should back up the neutral, but only if the connection completely fails. At that point, the plastic is already softened. I’d be curious to see how many people have problems using these devices with Ground Fault Circuit Interrupter (GFCI) outlets. How does this happen? Let’s run the numbers with a desk lamp. To keep the things simple, we’ll use a 60 W incandescent light bulb. Ohms law tells us that 60 W is 0.5 A at 120 V. The bulb’s resistance is around 240 Ω. Normally the voltage drop over the wiring is relatively small. But say the resistance at the slip ring is 10 Ω. Now we have a total resistance of 250 Ω. Current drops to 0.48 A, and power to 57.6 W.
4.8 V and 2.3 W of power are now being dropped across that 10-Ω load. That doesn’t sound like much, but where does the heat go? The slip rings heat up. Some of the heat is carried away by the wires, but not all of it. The rest is dumped into the plastic, which starts to soften. The softening plastic allows everything to start moving. The slip rings and contacts slide apart. The plug blades end up at odd angles. Finally, the connection starts to break. A few microns of space opens up between the contacts, which is easy for 120 V to arc over. Arcing starts, dumping more heat into the system, and providing an ignition source. From here one of two things happen – the soft charred plastic moves enough to break the connection, or things catch fire. The strange thing here is that Belkin knows about the problem. 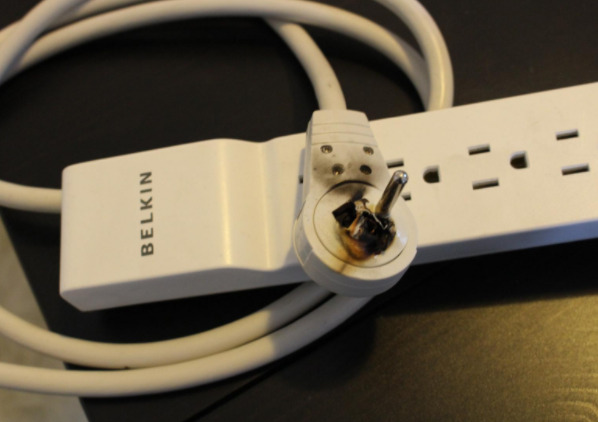 Back in 2009, Belkin recalled 68,700 surge protectors with rotating plugs. The problematic devices had all been manufactured in 2003. Whatever the manufacturing issues were, they were fixed to Belkin’s satisfaction, and the company is still making rotating plugs. My device, in particular, had a manufacturing date of June 2017. The problems persist though. 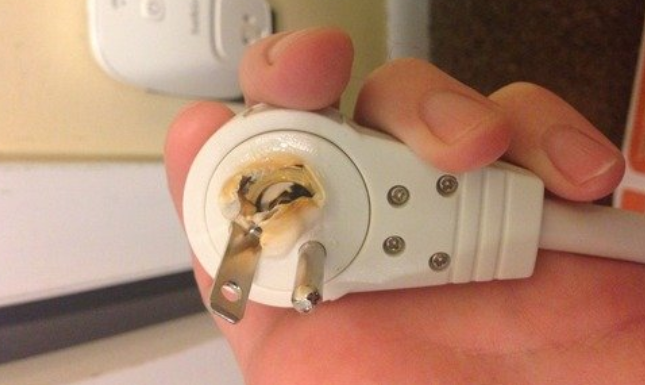 Pictures of melted plugs are all over the Amazon review pages – and not just the recall devices. These are new devices, purchased this year. The consumer product safety board has five reports of failed Belkin surge suppressors on record. In September a Houston news show investigated issues with a failed surge suppressor, but didn’t get very far with Belkin — however, this case seems to be one of a failed surge suppressor PCB, not the plug itself. Through all of this, it is important to note that the Belkin device and its plug are Underwriters Laboratories (UL) listed, so the devices have been tested and found to be safe by at least one lab. While Hackaday doesn’t have failure statistics for this particular model, it might be worth UL taking a second look at the design. This sort of thing can happen with any connection. The difference between the Belkin plug and traditional plugs is that the rotating slip rings provide many more points of failure. AC mains plugs take a lot of abuse. They get yanked out by their cords. They’re banged by furniture. They have to handle corrosion, dust, and gunk building up on their blades. They take heating and cooling cycles as high current loads switch on and off. All this happens over years, even decades in some cases. So why add multiple points of failure to a system which is going to be abused? Belkin has already been through a recall due to this rotating design. Judging by the photos on Amazon, they might do well to consider revamping the rotating plug completely – before someone loses their shop, their home, or worse. That said, they’re not the only company producing rotating plugs. Searching Amazon for “360 plug” reveals several other licensees of the 5,775,921 patent. Companies such as 360 Electrical are building outlet strips where every outlet rotates. Are any of them safe? As for me, I installed the fixed plug Belkin surge suppressor in my office. As for the second strip, the rotating plug will soon be cut off and replaced with a plug from the hardware store and the surge suppressor will live out its days powering the computer in my shop. ← DIY Barometer: It’s For Your Health! Amazing. And I wonder how many of them are still sold on Amazon? Oh and how’d you write that with all of those tribbles running around eating the munchies and consuming the coffee, and making more of themselves? So-Heres the thing. I’m not mechanical at All but I understand the words power strip and fire starter and possible results of that combination. We had a few of these in the house I read the post,checked the brand, chucked them all. Thank you,my house is filled with treasures. Most are living beings. Just being Belkin isn’t the concern, it’s the rotating prongs, so hopefully you only tossed similar ones, and not good power strips. I was shopping for a low profile plug a few months ago for my TV area–about 400-500W between display and HTPC. I was almost ready to buy the 360* rotating version from Belkin thinking that the brand name would mean it was designed/built better. I’m glad I ended up going with a fixed 45* plug instead! Rotatable plugs, never seen that before. I guess it could be of use to some, but seems a bit useless for all my power needs. Though, I wouldn’t mind a rotatable angled C13 plug, as those never seem to go in the right direction, at least all that I have found always goes in the same direction, and therefor only cover 1/4 of my angled power cable needs. 18 ga is next to useless and the 14 is overkill. I suspect part of why it lasts as long as it does is that people aren’t sitting day in and out rotating the plug. I have a handful of Belkin surge protectors in my house with rotating plugs. Years and years old. I got them because the fixed angle ones always seemed to be going the wrong way for what I needed. I haven’t had any failures like these (anecdotal, yes), but like you said, I’ve only ever adjusted the angle for what I needed and then left it there. It’s not getting spun all the time. The one failure I did have was on one that wasn’t in use and something heavy was accidentally placed on the exposed plug. The plug completely came apart in a way that that a fixed one probably would not have, but I didn’t feel cheated because it was my fault and they weren’t designed to bear weight in that way. I wonder if there’s an amperage limit for the plugs that people are exceeding? The opposite might be true: Perhaps you haven’t seen a failure because your power strips are lightly loaded. Adam’s analysis didn’t claim that the failure came about because people were rotating the plug. He says the slip ring mechanism is under-rated for the full-load current, which causes the plastic to soften which causes an even more marginal contact. The manufacturer name should match what’s on the power strip. If not, it’s a fake label. ehmmmm… why do you think that these holographic labels are impossible to be fake? These chines can make anything, then can make it better if they want, but most of the time the make it cheaper because the can, so they earn more by selling more for lower prices, because the customers always like to pay less. A special log doesn’t mean anything, the technical peopel who know what logo to look out for, don’t buy these plugs anyway, as they know how they work and know the potential hazards involved. The non technical people see a shiny sticker and don’t even know what it mean, so how would they know if the sticker is real or not… they just don’t care. The problem isn’t how it is made or how it is logo is applied the problem is that these things are sold by sometimes respectable (or trusted) sellers. If they would be (more) responsible for the trash they are selling then the stream of dangerous stuff lying in the stores would become less. However, since internet stores are taking over it is becoming very difficult to follow that strategy. So in short… we’re doomed! Doomed I tell you! The number molded into the plug is E152555, and the model number (BE106000-08R) shows up on the entry for that page. The genuine UL/CE labels are Made in China also. The Chinese basically will make whatever “The Market” wants to have made to exactly the quality they were asked to deliver. “Nobody” will care Until some of the CEO/CTO-segment “here” does the perp walk over this kind of fraud and abuse. Legal settlements won’t help, that is just the stockholders money which crooked CEO/CTO’s do not care much about. And, it’s supposed to be “CE” in the “Conformité Européenne” sense; not the “China Export” sense. For reasons that only an awful cynic would suggest are anything but coincidence, these look very, very, similar even when the vendor isn’t just using the real CE label because nobody is going to do anything about it. I have taken apart several cheap power strips made in China. The qulaity of construction I found has made me extremely reluctant to use them for anything but very low current applications (wall warts). They’re basically hard copper contacts held in place by plastic housings. Not what I would consider robust construction, even if they do have UL labels. That’s all you’ll find in most power strips, regardless of origin. Some use actual duplex outlets like the ones in your walls. I try to use that kind when possible. Indeed, that is the normal construction and I know of no extreme issues with them. Although to be fair, I do have one issue, the ones with a switch that has a neon light in it very often has that light fail or go super dim after a short while. Doesn’t affect operation though. But to be fair to the OP too: I did notice that the last few years the copper of the cheap ones sometimes appears to be less copper and sometimes either I suspect copper-clad (that’s not good and you hope it’s still up to specs) or some amalgamation, or simply thinner. Also they used to have the earth contacts chromed over, but now it’s all bare copper, which tends to go dull from exposure to air. But most of that applies to brand-name ones too, over time and with the nasty speculations on the copper market by the big banks the brand manufacturers no longer take a liberal ‘better than it needs to be’ approach but go with a ‘just keep it in specs’ one, and I didn’t have one melt or overheat so far, even when I put a hefty load on it so it appears to be indeed within specs. I’ve found brass/copper plated steel in some cheap crap, where you’d expect it to be copper or brass strip. Exactly as I feared, that is bad but not too hard to spot, you can even test it with a simple magnet, copper isn’t magnetic after all and iron is. So you can even test it in a store or inside the packaging even without doing damage. Unfortunately, companies adopt the notion that some risk is acceptable, for unacceptable risks they buy “insurance” to protect themselves. So, in the case of Belkin — they decided that the liability associated with selling an inferior product would cost less than what they would make from selling it. Hence, it’s an acceptable level of risk/liability. Until a family dies. How much money would Belkin have to pay to be “enough”? Several million dollars to the next of kin plus a few thousand dollars fine to US government for shoddy design causing fire plus recall of all the power cord costing a few million dollars more to take back the stock of power cords that would have to be destroyed? It simply comes down to a cost/benefit assessment. Pay a lawyer 40m to get you out of the 50m fine+liability+recall. The shareholders will reward you, and the CEO will get a bonus. If it is not MANDATED, the company won’t do it. And even if it is mandated, if they think they can get away with it, they will. Isn’t that the story of the Pinto? With the brake light rupturing the fuel tank in tail end collisions? They’re a bit on the thick side, and don’t rotate, but can be set to any 45-degree angle. This is really not worded well. The ground is not there to back up the neutral. It is there to protect relatively high-impedance humans from electric shock by being a low-impedance path to the protective earthing point for fault currents to flow in the event that the hot becomes connected to ground through the failure of a primary insulating barrier. It is NOT meant to serve as a back-up for a failed neutral connection, despite the fact that in most electrical installations ground and neutral are bonded together at some point. The neutral should “return” the current right, not let it go through human, so if it doesn’t and ground does, then ground is backing it up. Yes, but current will only flow through the ground if there’s another fault that connects hot and ground. The ground doesn’t automatically take over if the neutral is open. Oh I see what you mean, people are thinking back up should mean it leaves it fully operational, rather than a safety back up. Much like that airbags are a back up to a seatbelt but you can’t drive around with the belt off and a bag inflated in front of your face.. Exactly you are not allowed, under any circumstances I am aware of, to intentionally energize the grounding conductor. See GFCI (Ground Fault Circuit Interrupter ) and others. Technically current should only flow between hot and neutral, ground is meant only as a protection mechanism to protect the users and equipment. You’re right that you should never design for the ground to be energized. I’m speaking in the practical sense. If this plug were to fail on the neutral line, the ground would be there to do its job – act as a safety, so anyone touching equipment connected to the strip doesn’t get zapped. The open neutral would also cause a GFCI to trip immediately – but if you’re connected to a standard outlet, you’d never know the neutral had failed. Until you plugin something in (at that outlet or some other one) and that appliance lets out the magic smoke due to over voltage. The only time the ground is energised is if there is a short in the appliance, in which case any small leakage currents will be either safely grounded, or trip the optionally attached RCD in under 300ms. A simple open circuit failure of the neutral will not cause any current at all in the ground system. However, a simple failure on the ground wiper *will* remove a layer of protection from the system. Just… no. You seem to be quite confused on a number of fronts here. Please do not design or construct mains-powered devices. Correct the relationship between between the grounded conductor and the safety ground conductor is not understood by many if not most. No doubt (hopefully?) someone with better communications skills than I has posted a video to YouTube on the topic. Just like at least two persons post videos explaining why the ” it’s the amps that kill not the volts” mantra is both dangerous an ignorant. The reason the neutral is bonded to the ground at the service panel is to isnure that he neutral stay at zero potential, because if is doesn’t higher that 120V. could appers on branch circuits. Years old John Dvorak articles about an “exploding” monitor can be used to create a hypothetical model to illustrate how that can happen. I did that. I need to see if I can find to document, to pasted into the cloud for public viewing. I really don’t see the point is a rotating plug as the cable is flexible so can make any angle needed. then again, i live in europe and in my country the shuko can be inserted two ways. There are some places in my home that having a straight-out plug, or one angled 90 degrees left would put the cable wedged between furniture and the wall. It’s not a compelling reason, but it means you don’t have to order a different power strip for behind that one dresser that blocks the outlet. I think he means they can still be flushed to the wall, but at a fixed angle (maybe straight down, or 45 off). This should work in most places in place of a rotating plug. Wall-warts are the main reason. These are for applications where your plug is going to be blocked by something placed directly in front of it. My employer used these exact cables to provide power for the cubicles in my part of the office, before pushing the cubicles up against the walls. I can see the plug at the very top of the wall, with the cords headed down into the narrow gap. In the US it’s common for power outlets to be installed at roughly knee level, which means that almost anywhere in your average home finding an outlet means moving furniture. I don’t know much about power distribution in other lands, but I have seen a number of foreign (to me, anyway) outlets mounted above the level of typical furniture, negating the need for angled plugs. Or they’re located about 6″ above the floor. Some flood prone areas have in their building codes that all outlets on the ground floor have to be 3 feet above the floor. Ideally, having all electric stuff that high would be best, but that’s a bit difficult for things like refrigerators, dishwashers, clothes washers and dryers, range/oven combos. Outlets installed in carholes/garages need to be 4′ above the floor, because sparking can occur while [un]plugging and gasoline/petrol fumes linger near the floor. My experience with UL is that they are thorough, honest and do comprehensive testing. I realise that they have labs all over the world and they may not all be as ‘good’ but this surprises me. Perhaps it is time to update the standards. Not a trivial job considering how many different organizations effectively reproduce the standards almost verbatim. Can anyone see the holographic sticker from UL anywhere on any of these pictures (including those on Amazon)? I looked and can’t see any such labels in any of the pictures there. Does anyone own one that they can examine? The holograph is real. It’s on the bottom of the main surge suppressor body. I mean I don’t think Belkin is using fake stickers. I don’t think I got a counterfeit Belkin product either. Is there an “E” listing number on the sticker? I get the impression that what is not happening here is thorough mechanical testing. Electrically it all looks good, turn it this way, turn it that, all good. What they are not doing is twisting it back and forth a thousand time and then retesting, or other reasonable fatigue, corrosion and wear testing. I mean I have had light switches that don’t quite snap all the way over and sit there fizzing (arcing) I replace them and the old one has UL certification, it just got worn out. I wonder if the failure mode you described was recognized as a possibility by the UL inspector, but not considered hazardous in that context — after all, it’s not about correct operation, it’s about safety. But is twisting the plug back and forth a thousand times “reasonable fatigue”? I don’t know about anyone else, but for me, once a power strip is plugged in and stuff plugged into it, it may be months or years before it’s touched again. Yeah well I know people deadly scared of electrical fires who plug their appliances in and out every time they use them 5 times a day, and I tell them. “You know that’s more likely to CAUSE a fire by loosening your plugs and sockets.” but they know best I guess. Actually, I usually get the story that they know someone or friend of friend that unplugged their stuff religiously for every use, then that one night they forgot, (After managing to inflict 10 years worth of wear cycles on everything every 6 months) they had a fire. Over those months or years, dust and dirt will get in and sits on the ring. Then the slider moves and now is sitting as a resistive connection. That’s reasonable use. Another reasonable case is the plug getting impacted by a piece of furniture. The plug may look ok, but are all those internal moving parts still good? With a fixed plug, you can be reasonably sure they are. Now take that impacted, aged, and worn plug and use it to power a microwave oven, air conditioner, or some other high-draw device. Instant heating element. I think I’ll stick to the solid plugs from now on. Thank you for the informative article, sir! Slip rings are supposed to be used where 360 degree endless rotation is required. That’s not the case here. Why not just let the plug rotate through 180 degrees and just use wires? Because you just know someone’s going to force it past the stops. … so the customer will just force it harder. As soon as you make something idiot proof, nature produces an “improved” idiot. exactly my thought. You could do a captive ring design where pulling against the assembly would actually increase contact with the metals. 180 to 270 degrees could be achieved. So, products submitted to UL or other cert body are the qualification units built either as a pilot production run or in the lab of the company HQ. These qual units are NOT production. Then the unit passes with flying colors and the HQ management says, lets flip the production switch. Here is where the problems begin: The HQ has an approved design and are confident the DESIGN is good for mass production. Now the contract mfg’s are often in a remote location, far away from the US or origin HQ and away from the prying eyes of QA, Engineers and management – especially for a low $ power strip. Lest the cost reduction tactics begin. Instead of using e.g. ; the specified high melt point polycarbonate for the housings, nylon or PP or whatever got pitched in the resin hopper is used instead. Instead of 1 -2 oz Cu for the slip rings being used, 1 oz is used. You get the picture that production in certain foreign countries make it a priority to trim specifications and tweak material conformance to resemble, but not meet the drawing requirements. I have been a product developer for now, 40 years. This kind of problem follows every design cycle unless you personally know your vendors and they are in the same timezone. Just try to make a surprise visit to your China vendors location…they know weeks in advance and change up the materials to PROVE nothing is wrong. I’ve caught a few of these bait and switch routines, but not nearly enough! For further reading, check out “Poorly Made in China” by Paul Midler. He’s been there too and correlates well with what goes on with commodity type manufacturing. You’ve likely heard of Ecko Kitchen utensils many years ago, having radioactive material in them or Mattel’s Barbie products with lead in the paint? That’s what this is about…same as it ever was. I had one of these plugs go out on a UPS. Had to remove it. They are not just on power strips! There are also fixed flat plugs. What really bothers me is that all of them point to the direction which I don’t want. I want the cable to climb up because I have a dresser/cabinet/shelf in front of it. But on a receptacle that is ended with ground hole on the bottom, these flag plugs runs the cable down. Which is really annoying because if I want the cable to come out on top, the cable will have to make a turn (the cables are also flat). Is the assumption of “resistance at the slip ring is 10 Ω.” reasonable? It is copper touching copper, right? I am still using the 360 belkin surge protector. But it is connected to an AFCI breaker. The easiest (and probably the cheapest solution to your plug angle problems) could be solved by simply rotating the wall outlet socket 180 degrees. . When I am using an extension / surge protector, I want it done quick. Flipping the receptacle would (in my case) mean pulling the furniture out for me to work on and also shutting down all the electronics along the same circuit. Also, flipping the wires may not be as straight forward as rotating the receptacle 180 degrees as the wires behind will be tangled and hard to push back in. This could be easily solved if the manufacturers make a plug that goes the other direction. I doubt many people need 2 to use on the same receptacle. Even if they do, chances are they will buy 2 at the same time. Unfortunately, at least in Australia, you are legally required to get a qualified (and licenced) electrician to do that. At a minimum callout fee of $100 (usually more), you could buy a pretty damn fancy powerstrip instead. A good solution yes, but certainly not legally ‘the cheapest’! Here it is also somehow mandated. But who should know, when I change or install an outlet? I just don’t ask anybody. It could be different when you live in a rented apartment, but there is not something like an “electrical outlet checking officer” who could force access to your living room. Of course you should know, what you do, if you do it, because it is dangerous if done wrong. In some locations, the outlet must be mounted a certain orientation or it doesn’t meet code. Ironically, in one location I visited, the code for business locations code required ground pin up, while the code for residential, clearly written by a different group, was ground pin down. then choose the suitable one. I’m going to agree with everyone suggesting to flip your outlet so that ground is up, and go further to suggest that you do that to all your outlets. It’s safer in case something metal falls on a partially removed plug. I think ground down is so you don’t curl your finger under and touch the live or neutral when plugging in, or pulling out. Another reason to keeping ground down has to do with wall-warts orientation and weight. The current standard in US is ground on top. It supports the weight of the cable better without pulling out and then does not expose hot blades if the other way around. Someone a long time ago liked faces, but now we have grown up. It also gives a visible point of reference to aim for when inserting the longest pin first, instead of hidden under like some people do with toilet paper. I respectfully disagree. An old style fuse / breaker will only trip if both conductors are shorted. A RCD/GFCI will trip when either the other part of the metal object touches something (like an earthed human); or like with a fuse, both conductors get shorted. As many houses still don’t have RCD/GFCI, a metal object touching only the active becomes a death trap waiting to spring. I have some of these belkin rotating strips, I’ve had them for a couple years now. I’ve always wondered about the connection integrity. Perhaps it’s time to crack them open and give them a more dedicated connection. Distributed losses in wiring get …… Distributed. What is an AFCI and where is it required as of 2014? What causes the glow, Ohms? Yes, filamentary my dear Watts-on…. 60 of them. Country / counties where this is now mandated? A nice improvised power strip :-) But I have the tendency to move a little, while asleep (most people do) and this looks like a bad combination. Your assertion that houses weren’t built for high electrical loads back in the day is not the case. Older TV’s used to run in the 20-30 amp range, so too with major appliances. Electrical motors of the day were not as efficient as those we see in modern times. Compared to modern devices, individually, the older ones positively gulped power. The thing in today’s world is the quantity of devices found in the home. But the awareness of electrical loads we use has diminished in the modern world compared to “olden times” due to the efficiency of the devices we use. Just think of the last time one tripped a breaker or blew a service fuse just for turning on a blender or a television. You may have misread – or I may not have been clear enough – I was stating that we have many more devices to plug in these days. That’s why power strips have become a necessity of modern living. As for the load question – older houses often weren’t built for large loads. Originally houses had fuse boxes, then 60 and 100amp service was common. Now, you’ll generally find new construction built with 200amp service. TV pulling 20-30 A? No way. The heaters for the CRT and all the vacuum tubes sucked down a crazy amount of electricity. Even with the early solid state stuff running at 12 volts they were still power hungry. Through the early 1970’s companies were still selling build your own 25″ Color TV kits as a series of courses to learn all about televisions and how to repair them. It would be fun to find complete, unbuilt, set of the kits for one of those, along with all the instructions, then put it together. That sort of thing went away when ICs began replacing huge boards full of discrete solid state parts. 20 A at 120 V is 2400 W, so no way. I know you might be talking about the inrush current, but even that is nowhere near 20 A. This is crazy wrong, by about an order of magnitude. Most TVs would be easily under 2A (less than 240W). Besides the standard household outlet is good for only 15A. If your TV took 20A, you’d need a special outlet and plug. I shudder to think what your electric bill would be like with a 2400W (or 3600W) space heater / TV set in the room. Much less your air conditioning bill. It’s worth noting that alternator slip rings have the ring look like a ring you wear on your finger, where the contacts ride around the outside, instead of flat on the top. It’s a design that is much more robust, although not as compact. This style of slip ring was used for some steering wheels before we all hade 20 buttons controlling everything from the radio to a fancy jeads up display. Those old ones, had many problems and were common to replace. Now almost everything uses a clock spring, that the author described with a ribbon cable wound in a circle several times, with no sliding contacts, and it’s very rare to have to replace one. I have seen my share of dead steering wheel controls. Replacement is usually quite a mess, airbag! I hope it’s wiring is much more robust than all that other stuff. I remember when it was just one ring that was visible thru a crack in the shroud. Cleaning it fixed intermittent horn. The spiral ends up flexing too much at one end and breaking. I find it still quite astonishing that only the British put fuses in extension cords. It makes so much sense. Nobody checks current rating before plugging in the microwave and kettle int the same cord. You do see some north american power bars with a screw in black fuse holder… not all that common though. Current rating of most power strip s here is 3500W (16A) and that is handled by the fuse/breaker in the fuse cabinet anyway. The only reason British plugs need fuses is their ring line installation which can deliver up to 30A or 32A. You set the angle in any one of 12 positions as you assemble it. Worth every penny for convenience and peace of mind! 13$ ??? does this have golden contacts? The more connections you have, between the source power supply, and the object using the power, the more potential you have for a problem. I looked at these rotating plugs years ago and said NOPE, too much of a chance of an issue. while I understand the concern and it is very serious I think it would have been fair for you to have another power strip and load it to say 90% of rated capacity for an extended period of time to see if there is an actual failure under real world conditions. If not then test it to 100%, 110% etc. to the point of failure. Studying the design and using other peoples unverified results to draw a conclusion is not good science. Also you stated that you will use the power strip minus the rotating plug in an un monitored long term situation (powering your computer) Why would you assume that the rotating plug is unsafe junk but the rest of the unit is high quality? Amazing explanation. Thanks a lot.